One of the key parts of my “one month” strategy is simply waiting until manufacturing coupons line up with store sales on the same item, which seems to happen pretty frequently if you hold onto the coupon for four to five weeks. However, many stores around here mix together the sales in their flyers with in-store coupons. 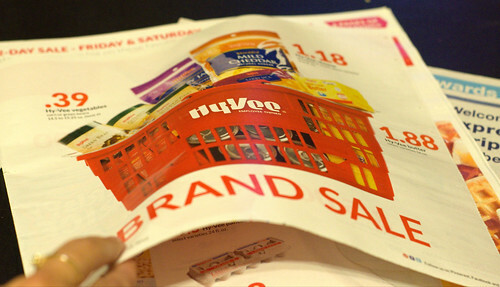 In their flyers, you’ll often find quite a few coupons that reduces the price of a particular item in their store. The same thing holds true here, too: hold onto your manufacturer’s coupons until they line up with the coupons issued by your store. I actually have a great example of this. A few months ago, I found a coupon for Tropicana orange juice on one of the coupon sites I visit every once in a while. Orange juice is something that our kids love to have with their breakfast, but all of them like orange juice with some pulp in it and the cheapest kinds are usually pulp free, so I watch out for coupons for orange juice. I clipped the coupon, intending to hang onto it until I found a sale on Tropicana. Lo and behold, about a month later, our local store had coupons in their weekly flyer knocking another $0.50 off of the Tropicana orange juice for that week only. I left the store with four jugs of the juice, which we used for the better part of a month. I can relate similar stories with all kinds of products, from cottage cheese to eggs, from yogurt to bread. I find a manufacturer’s coupon for an item that we already buy, I hold onto it for several weeks, and then the store issues an additional coupon for that item. I head to the store, using both coupons for that one item. Again, as with anything, this works best if you just have a simple routine about it. Once a week, grab manufacturer’s coupons on items you use. Hold onto them for a while. Watch your preferred grocery store’s flyer. Sometimes, you’ll find the store has their own coupon for that item. Use both of them at once and you’ll get an item for very little. If you went through this effort for just one item, it wouldn’t be worth it. A $0.50 manufacturer’s coupon coupled with a $0.50 store coupon doesn’t add up to riches. It works if you have a simple routine to gather lots of coupons, stick to coupons for things that you use, and exhibit some patience. Sometimes, we’ll drop twenty or thirty coupons on a single store visit and we’ll find that our total dropped by $20, just because we saved a few coupons while browsing the web on a lazy evening. That’s well worth it in my eyes.